The BBK Vivo Xplay is a high-end Android smartphone with a 1080p 5.7-inch touchscreen display. The device is powered by quad-core Qualcomm Snapdragon 600 running at 1.7GHz, is available with either 16GB or 32GB of built-in storage, and comes with NFC. The Xplay runs a custom version of Android 4.2. 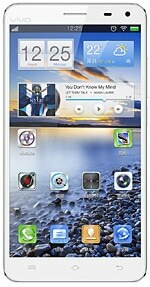 The Vivo Xplay is available in China for ¥2,998 or about US$490, reports Engadget, and became available in late May 2013.